FIGURE 4.7. Bilateral osteonecrosis of the femoral head. 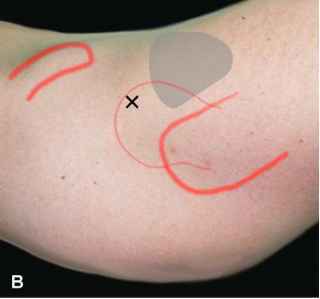 (A) Coronal Tl-weighted image of both hips demonstrates a linear focus of decreased signal (arrow) parallel to the articular surface in the right femur defining the margin of the osteonecrotic segment. Also, a large heterogeneous area of decreased signal is seen in the left femoral head extending into the left femoral neck. (B) Coronal T2-weighted fat-suppressed images of both hips reveals a large left hip effusion, increased signal in the left femoral head and neck (class C), and small focal areas of increased signal in both femoral heads. 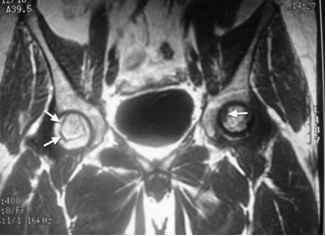 (C) Coronal Tl-weighted image of both hips anteriorly demonstrates a linear ring (arrows) of low signal defining the margin of the osteonecrotic focus that is isointense with fat (class A).